"It's probably the biggest compliment you can get, that you take mechs to Japan and they like them." At this year's Tokyo Game Show, the surprise show-stealer was Respawn Entertainment's Titanfall, which by the end of the show had four-hour-long queues snaking around the Xbox One booth. What's particularly surprising about this is A) it's on the Xbox, which historically hasn't performed well in Japan, and B) it's a first-person-shooter, which is not as big of a genre in Japan as it is in the west. 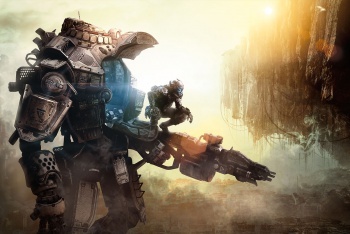 Respawn's community manager Abbie Heppe was just as surprised by the game's positive reaction, telling Xbox One Magazine "It was crazy." "We weren't really exactly sure how Titanfall would read with the Japanese audience. It's a first-person shooter and that hasn't always been the biggest genre there, so it was like 'Eh, we'll go to Japan and see what happens' and the coolest thing was that we came away and got a ton of feedback about the Titans from the Japanese audience there, and it was really nice." Anyone who has delved into Japanese anime or videogames will know that mechs are kind of a big deal to Japanese people. "It's probably the biggest compliment you can get, that you take mechs to Japan and they like them. That was awesome," commented Heppe. Heppe says that while Western audiences were most impressed with the speed and velocity of the game, for the Japanese, it was all about the mechs, something she found amusing because "When we were first starting to figure out how we were going to talk about Titanfall it was like 'lets not use the word mech'. Because mech has, especially with Western gamers, an association of slow and heavy, and you have these expectations of gameplay that really wasn't what Titanfall is." However, going to Japan changed the team's perception. "We really shied away from the word and then we went to Japan and it was really embraced there. 'Ok, so we are going to talk about mech here.'" Shooters, like Call of Duty and Battlefield are slowly starting to gain traction in Japan in recent times. Maybe it won't be a "big-name Japanese RPG" that sways the Japanese to the Xbox One, but Titanfall.